pommel brass w/simple scent-stopper shape. overall length of 57 inches. A.Two Handed Scottish Claymore- Dating back to the 15th - 17th centuries in Scotland these swords were used in the border fights with the English. They're typically characterized by having a cross hilt of forward-sloping metal bars with quatrefoil terminations. Our version features a wooden grip, rounded pommel, a hand forged EN45, fullered ,carbon steel blade and the elegant forward-sloping quillons along with the characteristic quatrefoil terminations. B.William Wallace Sword- Inspired by the sword that belonged to William Wallace, who was a knight and Scottish patriot in the 13th century, who fought in the Wars of Scottish Independence and the Battle of Stirling Bridge. Our version has a solid damascus steel guard and pommel, and suede leather wrapped grip. The hand forged EN45 steel blade is 40 1/2" long, and overall 54 1/2" in length. 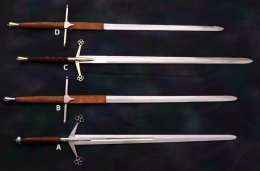 C.Twisted Claymore- The Twisted Claymore, named for the distinctive grip, is patterned after the great two-handed blades that were commonly used by the English and the early Scottish during their clan warfare and border disputes. This sword has a relatively straight-edged blade, with the edge beginning just above the guard and continuing down until it tapers sharply to an angular point. The brass guard features two downward angled arms that end in quatrefoil design. The grip features the twist-pattern. The pommel is also brass and features a simple scent-stopper shape. It has an overall length of 57 inches. D.William Wallace Sword (Brass fittings)- Inspired by the sword that belonged to William Wallace, who was a knight and Scottish patriot in the 13th century, who fought in the Wars of Scottish Independence and the Battle of Stirling Bridge. Our version has a solid brass guard and pommel, and suede leather wrapped grip. The hand forged EN45 steel blade is 40 1/2" long, and overall 54 1/2" in length. This page was last modified on 7 July 2014, at 18:10.